Will a stock GR sti tmic fit a GD sti? Well, I'll let you guys decide. Stock GR sti tmic vs GD sti tmic comparison. The bigger unit is the GR core with no throttle body hose. Now on to the test fit. First you will need this 3rd bracket from a GR sti and bolt it on in place like it's shown in the bottom picture, if not you can always fabricate a bracket to extend it out to accommodate for the larger core. A quick install tease to see if it fits. So will it fit? I'll let the pictures do the talking. I posted this in other forums but maybe it will help someone here in Nasioc. P/N on the bracket for future parties to swap ICs would be great. I thought about this a while ago, and figured it would only take using the GR brackets. You would only need the 3rd bracket in the 4th picture, all other brackets are identical in previous years except for maybe the models that do not use these type of brackets. Now this install/experiment was only done with a GD DBW sti so I'm not sure how fitment is with DBC and etc. subarus. I would also like to add that a modified stock heat shield fits with no problem. Hood scoop splitter modification is also a must, if your going to use this bigger GR sti tmic you need to get the most of out of it, which is not hard to do. Strong work! This ought to provide adequate cooling up to 20G or so. Appreciate your efforts. Yes this will be more than adequate for a 20g and I've heard of some other tuners running this on a rotated 35r. I've tuned a few GR sti's and the tmic does a good job of cooling much better than I expected. Thanks, fitment is just as good as stock and install was a breeze. Looks stealth too. I have an opportunity to buy one for my 07 wrx, I was going to pass on it, but I think I will take it now after seeing your pictures. I shouldn't have any issues on a wrx right? With a WRX you may need the STI brackets. 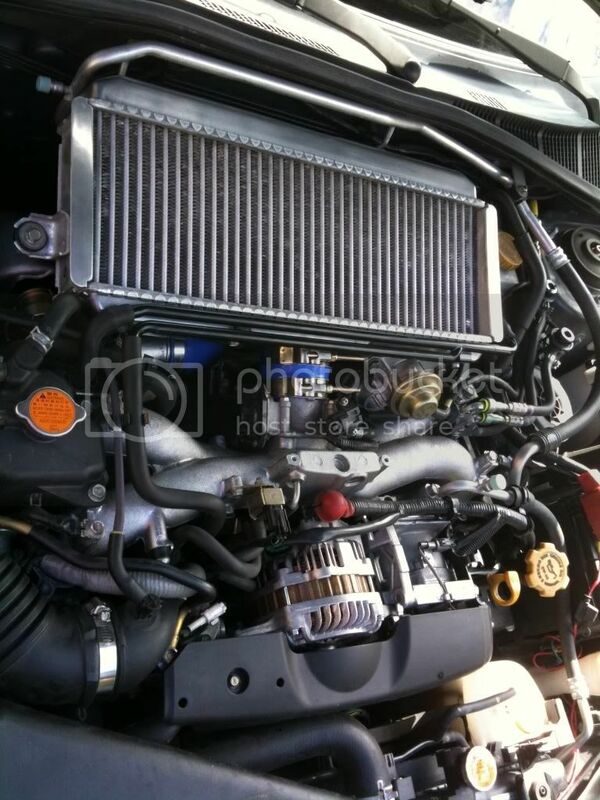 I don't recall, but there should be a thread in the 2L forum about fitting an STI intercooler to a WRX. what kind of modification to the splitter would you need to do? how is this unit compared to process west? Honestly you can make this tmic fit with slight modification. 07 wrx are DBW's so it should fit if not you will have to play with the y-pipe, elbow hose, and throttle body coupler. You can cut or extend the hoses I mentioned above and those play a major role on how you want your fitment to be. I have no idea but the process west coupled with its own splitter should be better but overall this tmic is a good option compared to the previous years. I've also owned a version 7 sti tmic and I've ran that with my old fp green setup in the past with no problem. Also it also depends on how much your willing to pay. As you can see from the picture it's noticeably bigger. You will have to cut the splitter to fit the larger tmic core. It's not that hard to do and I've done it in the past with other aftermarket tmics. Here is some good read http://forums.nasioc.com/forums/show...light=splitter and modification is something but not quite like this. Maybe when I have time, when my busy schedule permits, I can do my own DIY version of modifying the splitter. Not too sure on the brackets as I have some wrx and sti IC brackets at home but I think the changes is due to the intake manifold/throttle body design from previous years not so much on the brackets themselves. Then again maybe I'm wrong but I have quite a few brackets collecting dust in the garage. 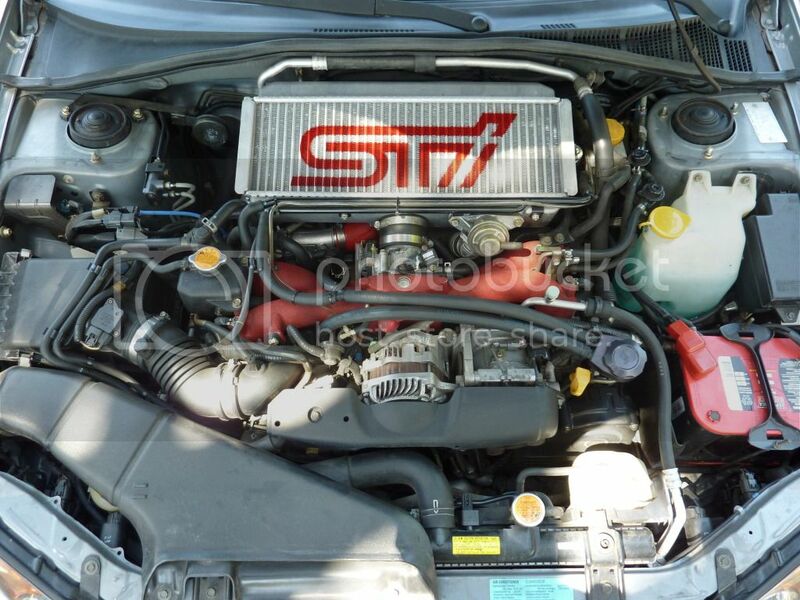 i was planning on running a v7 sti top with a 20g but if the new GR's are bigger i might have a take on one.. Yes a bit bigger. And remember if you have a wrx get a sti splitter(modification also needed) or simply just modify your stock splitters. Thanks for the thread Blue Stinger! ^^^ Wow that looks awesome, it looks like it belongs in there! Glad to be of some help. I'm digging the blue hoses too. bumping up an old thread but I would like to add a few things from my installation on an 07 WRX for future reference. I ran into fitment issues with the stock GRB bracket so I trimmed it to make it literally an extended piece. As stated before, you can measure and fabricate a bracket at a local hardware store. The stock y-pipe red hose is just as much of a PITA to get on as the 04-07 STi intercooler y-pipe red hose is (as they are the same size) so getting an extended y-pipe hose makes installation easier. I was still able to reinstall the JDM STi FHI Titanium front strut bar without any fitment issues. SPT or similar style turbo heat shields will not fit due to the extended bracket. The Subtle Solutions GRB Intercooler splitter will fit under the 06/07 hood scoop without the intercooler splitter if you want to cheat. However, the GRB splitter sits a bit slanted due to the lower passenger bolt and removing the intercooler splitter does not allow the air to directly flow over the last 1/3 section of the intercooler so modifying the intercooler splitter is still needed for efficiency. Anyone tracked down the part number for the 3rd 'extra' bracket to fit these TMICs to GDs? Also just feeding back to my question. the part number for the bracket is 21885AA330, ~$47 from Subaru Australia. Might do some US-investigation methinks.